When were icons first introduced & can be proven? Topic: When were icons first introduced & can be proven? Re: When were icons first introduced & can be proven? You certainly are sticking to something. I believe in God the Father. 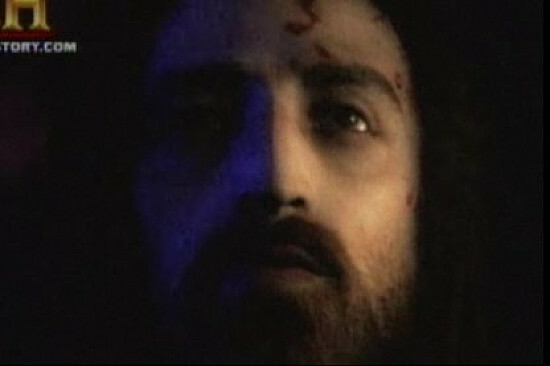 I believe in the Son, who was also part of God. and I believe in the Holy Spirit, which is part of God. You do know that the Jews believed in many parts of God right? Including "The evil spirit of God". They also believe "The Lord your God is one". But my point was, that original Christians didn't say "Trinity". They didn't say "Bible" either. Is that on the chopping block? Nor did they "have" a "Bible" as we know it today or the past 17 centuries or so. Did the "original Hebrews" say El, Elohim, Yahweh, Adonay, Jehovah, Hashem, Adoshem, HaMaqom or HaQadosh barukh hu? Likewise, when my wife and I were married we didn't have kids, we didn't have grandchildren, we didn't own a house, we didn't host a family Thanksgiving dinner, we didn't have a computer (or even a calculator! ), we didn't have cell phones, we didn't plant a garden, we didn't have grey hair, we didn't have boxes full of photographs, we didn't have 38 years of shared memories. Are we more married or less married than on our wedding day? All healthy relationships grow and develop. How odd it would be for my wife and me to be living exactly as we were in 1975. Exactly. Even if icons didn't date to the early Church, which they do, they could simply be a legitimate outgrowth. Along with copies of the Bible, church buildings, Christian books, and these neat things called computers and online forums. Well YiM, I would say it wasn't really necessary until certain heresies came about. Do you agree? Refuted no. Murdered and excommunicated, yes. The Iconodules weren't refuted but murdered and excommunicated. He was speaking of iconoclasts and comparing me to one. Iconoclasts were murdered by iconodules. Other than the parts you dont like. I just don't kiss paint and wood while saying "beam it up St. Peter". And certainly I accept the 1st and 2nd Century stuff. Why else do I ask for it so much? Odd thing is, and the harsh reality, there were no icons used by the earliest Christians, or writings about icons. Odd thing is, and the harsh reality, you depend on the earliest Christians who used icons and wrote the Scriptures for the Bible you claim to read. The same St. Polycarp whose relics were gathered up for veneration immediately after his martyrdom? Neither does a Biblical canon. Gah, and to think, this man worshiped on the Sabbath AND practiced the Jewish feasts..... He's a saint too, but by EO canon, anathema.... Irony at its best.... You really can't make this stuff up. And yet you continually do. Btw, St. Polycarp worshiped on Sunday (and every day leading up to Saturday). And no, he didn't practice the Jewish feasts. There were no icons in use, nor venerated artificial images in the earliest Christian church. so Jesusisiam pontificates ex cathedra outside of the Church. Today. Look, I'm too old for pot shots, really don't care. If you believe this about Polycarp, you need to seriously look into the Greek letters and the mistranslations of them, including the Didache. unlike you, I can read the original. 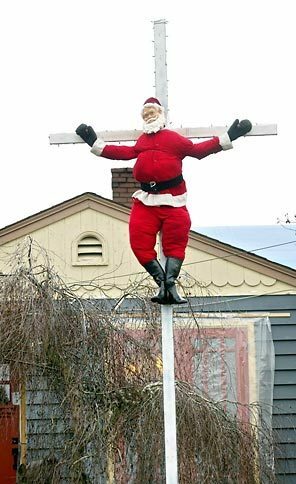 One reason why I stick to original Christianity. Guess who knows what it talking about. I'll get into the particulars later, God willing. I gotta get to bed. Yep, and when documented, that New Testament contained NOTHING which I wrote about above. You first have to prove the relevance of the New Testament to the discussion. As has been pointed out, the NT Canon didn't exist, so what it contained doesn't support your line of argument. You like repeating yourself ad nauseum. Run a spell checker through your rantings next time. He keeps saying he's practicing Original Christianity throwing in pot shots. So I repeatedly have to prove to him that he's not. Btw, I'll go into detail, but in the meantime, on your denial of relics, Acts 19:12. And as has already been asked: so, you have decided to deny Trinitarianism? Of course not. They didn't speak English (yes, I know it comes as a shock to you, but the King James isn't the original version). They didn't say "New Testament" or "Anabaptist" either. As for your strange theology...well, what can I say that St. Peter didn't at the end of his second epistle? Fales. Everyone knows that KJV 1611 is the only true version of the Bible. The church didn't even start until 1611, it was all just a sea of apostacy before that. Just ask noted Bible scholar Peter Ruckman. He will guide you into all light. A fully grown tree looks a lot different from when it was a sapling. YiM's argument is essentially,"But it's got all these big branches, fruits, and flowers, and stuff, it can't be the same plant as that little sapling." If you try to hack off all the branches of a tree to try and make it look like a sapling, you'll just mutilate the tree and kill it. Same with the Church. Excellent, ISTM that's what the Protestant Reformation did - hacked off the branches to make the tree look like a sapling. I'm pretty sure the Protestant Reformation just picked up all the branches laying around on the ground, glued them together and declared that it was really the church. Seconded. A brilliant and potent demolition of yesh's "argument". As is well-known, the earliest icons of Christ were widely reported to have be derived from an image “not made with hands”/αχειροποίητα cf. Mk 14.58; 2 Cor 5:1. Many of our forefathers grounded the iconographic tradition and God's own stamp of approval upon it not in the likes of catacomb art, but in an image produced by the finger of God Himself that was handed down in the Church. The Orthodox Church still observes a feast commemorating the transfer from Edessa to Constantinople of a relic known as the Holy Mandylion “not made by hands." 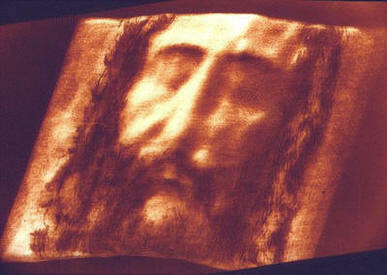 Recently the Shroud of Turin was dated to the first century: http://www.firstthings.com/blogs/firstthoughts/2013/03/27/new-experiments-suggest-shroud-of-turin-dates-to-first-century/ As Alveus has alluded to such a date for an artifact is earlier than the extant manuscript evidence for the text of the New Testament itself. I have always thought the Shroud images were a dead ringer for the ancient Pantokrator icons, gold coins from Justinian’s reign, etc. The images by the very degree of similarity itself seem to bear witness to the Shroud as a prototype. 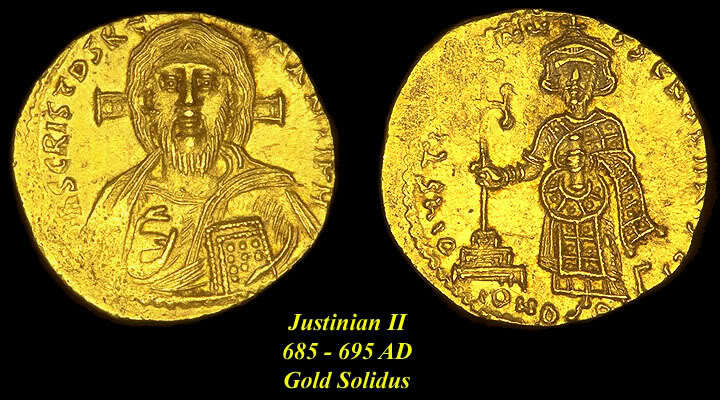 Comparing the images below, notice how the photo of the Shroud of Turin, the image of Christ from a gold coin during the reign of Justinian II (dating between AD 692 and 695), the Pantokrator icons from Hagia Sophia in Constantinople (built under the personal supervision of Emperor Justinian I), and the monastery at traditional Mt. Sinai etc. all look similar. 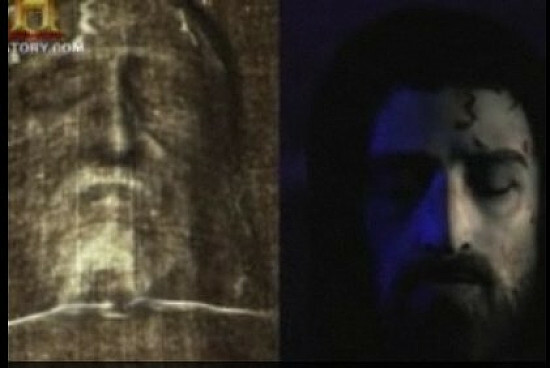 Also compare below a 3D reconstruction of the Shroud image as depicted in a recent History Channel documentary. 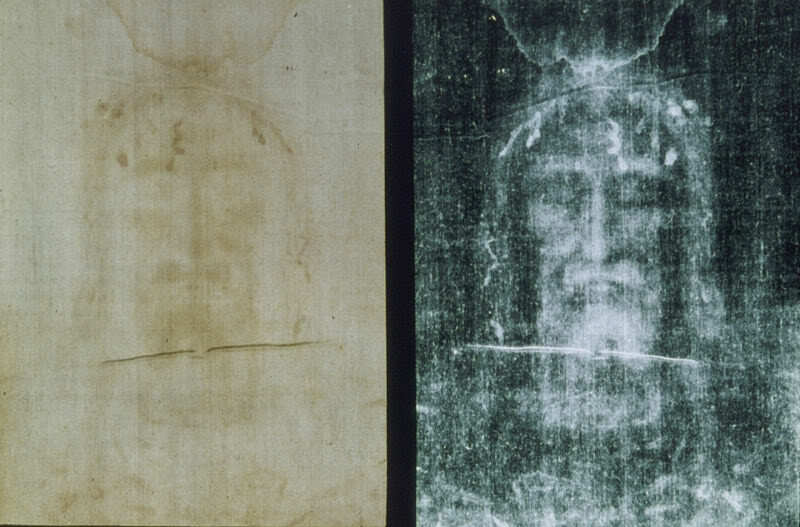 Ian Wilson suggested the theory that the object venerated as the Mandylion from at least the sixth century was in fact the Shroud of Turin, folded so that only the face was visible and enclosed in a frame (Wilson, Ian, The Turin Shroud: The Burial Cloth of Jesus Christ?). A tenth century codex, Codex Vossianus Latinus Q 69 refers to an eighth-century description of an imprint of Christ’s entire body left on a canvas kept in a church in Edessa: “King Abgar received a cloth on which one can see not only a face but the whole body” (in Latin: [non tantum] faciei figuram sed totius corporis figuram cernere poteris). The scientist who performed the original C14 dating retracted his 1988 position that the Shroud was a medieval forgery in a peer reviewed scientific journal -he discovered the fabric he tested was a patch later sewed onto the garment to repair it; the date of the shroud at that point once again became an open question. Now with the Shroud being dated to the first century we might consider it, to the extent that the dating is deemed reliable, as an evidential witness to not only the Shroud itself, but the whole iconographic tradition which the early Christians said was based on something very much like the Shroud. I am also still impressed that a 2D object contained 3D information sufficient in itself to produce an image like this centuries before the invention of photography. The metaphor is incorrect & loaded. As a sapling was created through the fruit of another tree. In the torah we read "after its own kind". Iconography is not after any kind, and was purely created by men. Look, we can pot shot all we want guys, but there is this thing called the truth. I've asked for historical reference, proof, and writings of Christians between 0-150AD referencing the veneration of icons, use of icons, etc. Also looking for artifacts of that time. It think that is fair. Immaturity & pot shots do not equate to proof. They may make the EO feel better about their position, with an underlay of delusion. As important and widespread use of iconography there is within the EO faith - which claims originality - why are there no writings about them or icons themselves (from 0-150ad)? Iconography is not the tree, the Church is the tree. If you want to attack the metaphor, you have to at least know what the metaphor means. So the sapling came from what? THE FRUIT of another tree. When Christ started the Christian faith it was the original. It's fruit should bear fruit "after its own kind". This metaphor actually gives credence to what I am asking about. If iconography was originally part of the faith, then we'd have some fruit/branches/proof of it. But it was not. So I can only see iconography as "another plant" growing along side that tree..... Whether or not is a weed... That's another topic. The iconography would be the fruit of the tree. Why would the first century church need icons of the Apostles? They were talking directly with them. We don't make icons of living persons. You could just as easily say that there were no books of the Bible written in the first 30 years of the Church, why suddenly 30 years after its beginning does the Church need more books in the Bible? What is an allowable timeframe from the time of Christ's death until something appears is it considered original? There were heretics before the Gospels were written. Should we accept them as more authentic because they are older? The metaphor is incorrect & loaded. The "metaphor"-which is actually an analogy-is spot on. The only thing it is loaded with is the truth. Which is why you don't like it. As a sapling was created through the fruit of another tree. In the torah we read "after its own kind". Iconography is not after any kind, and was purely created by men. The images of the Tabernacle, Temple and Synagogue show otherwise. Iconography was not written in our scriptures at all and there are not provable icons or usage of them. Neither is the Table of Contents of the Biblical Canon, but you use ours (at least of the NT) anyways. They are a major part of EO theology, yet not in originality. Yes, we are familiar with your mantra. No, it has not grown in strength by repetition. "the Word became flesh and dwelt among us, and we have beheld His Glory"..."He who has seen Me has seen the Father"..."But even if our Gospel is veiled, it is veiled to those who are perishing, whose minds the god of this age has blinded, who do not believe, lest the light of the gospel of the glory of Christ, Who is the icon of God, should shine on them. For it is the God who commanded light to shine out of darkness, who has shone in our hearts to give the light of the knowledge of the glory of God in the face of Jesus Christ."... 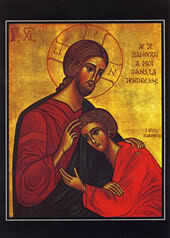 "He is the icon of the invisible God...in Whom the Godhead was pleased to dwell." We have the promise of Christ that Hell will never prevail over the Church-if the Church fell into idolatry, as you accuse her, then He is a liar. 1This second epistle, beloved, I now write unto you; in both which I stir up your pure minds by way of remembrance: 2That ye may be mindful of the words which were spoken before by the holy prophets, and of the commandment of us the apostles of the Lord and Saviour: 3Knowing this first, that there shall come in the last days scoffers, walking after their own lusts...14Wherefore, beloved, seeing that ye look for such things, be diligent that ye may be found of Him in peace, without spot, and blameless. 15And account that the longsuffering of our Lord is salvation; even as our beloved brother Paul also according to the wisdom given unto him hath written unto you; 16As also in all his epistles, speaking in them of these things; in which are some things hard to be understood, which they that are unlearned and unstable wrest, as they do also the other scriptures, unto their own destruction. Icons in ornate served settings, being bowed to by clergy like that... The likenesses of things in heaven. No proof in the 1st century, and very little proof of icons until the 4-5th century. Just every Church ever discovered before the 4th century has them. And the catacombs, which are full of them, went out of use in the 4th century. By the 10th century, they were all but forgotten, a hidden surprise for the iconoclast Protestants a century after the Reformation. Do you really think Paul warned about people trying to follow God's commands, or those who try to convince people to break God's commands? "His letters contain some things that are hard to understand, which ignorant and unstable people distort, as they do the other Scriptures, to their own destruction." You are following the Pharisee Saul, not St. Paul. As the EO faith claims to be the original, why are there no writings by the earliest Christians, artifacts, or scriptures referencing icons or the veneration of them? Even in the writings of the earliest saints..
You are the living proof that history should be done by historians. And that too much crime TV shows are ruining juries. Yes, and you have proved yourself a stranger to it, while we know Him. Only if you can produce a Christian artifact of the same time period. Immaturity & pot shots do not equate to proof. Your posts are proof of that. They may make the EO feel better about their position, with an underlay of delusion. And your proof that you are not deluding yourself? You have already accepted our proof, i.e. the Scriptures, while denying its source. Jesusisiamism is going to have to have its Joseph Smith Jr. moment to get the scriptures to "prove" its point. Why are there next to no writings, if not none, about them 200-313, when we have the actual images themselves (Dura Europas, catacombs, etc.)? There's a task for you: show us some writing on icons from 200-313 AD. The EO church validates icons, I asked for apologetics and proof of them in the earliest church. You can't prove it, it's really that simple. 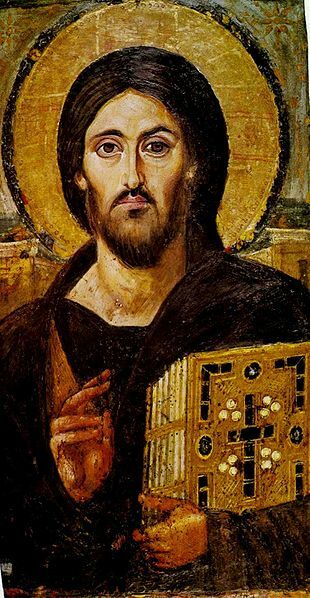 Icons were NOT an original part of Christianity. To those saying that "why would they need them when they were alive in the 1st century...", is a ridiculous argument. This is because there are many icons the EO has that do not have the apostles in them, such as the Trinity icons, icons of angels, and OT stories. To my analogy argument about it being wrong, you just basically said "no it's right, yuh huh". No backing. Things created by God produce fruit after its own kind. The original Christian church did not have icons, thus the "fruit" of icons attributed to the analogy would be wrong. Besides, arguing with an analogy in order to prove a point when somebody asks for physical or written proof is rather... weak isn't it? The trinity, icons of archangels, and OT stories...... There are way more icons than just NT apostles. I understand what you are saying, but seriously ialmisry, this is like chopping your own foot with an axe. There are very few instances of "cave art" from that time frame, couple those "latter years" with a lack of text attributes, and it only gives more credence to the argument I am presenting. The text attributes would not only lack the mention thereof, but also lack the mention of the veneration of the images themselves, the use of the images, etc. So it may be nice if you produced any writings and teachings (such as venerating an icon is the same as venerating the person in the image). Yes, it is later on than the ideal years, but it may be something more than nothing. Also of the 3 links you posted, they are interesting and are some of the arguments I am presenting. I'm asking for "something", as I have no reason to believe that icons existed in original Christianity. We have many artifacts and writings, but nothing about icons from that time. Shouldn't "SOMETHING" have survived? At what point do these arguments hold validity? C) No writings or teachings of veneration of icons, blessing icons, or the usage of icons, images, etc. So if there are no writings, artifacts, fragments of artifacts, teachings of icons, etc., why would it not be safe to conclude there were no icons then? Orthodoxy is original Christianity. You are not. We are not interested in your 21st century fruit from your 20th century sapling. I was talking about Mt. Sinai in another thread. At the monastery in the official one, they claim to have the original burning bush, alive and well. So if they can have the original burning bush, alive and well, and nobody has an example of a writing or icon from 150AD, there is a problem. ialmisry, you are 100% missing the point. I don't even get your "assignment". Well I found something in the years speaking of veneration of images (or forbidding them in churches). Now I assign you something from 150A.D. or earlier please PROMOTING the veneration of images or icons themselves. No, as we have several icons that are claimed to be from the brush of St. Luke and from the 1st century. And even if we didn't, it still wouldn't be a problem. The monastery in Sinai dates well after we have attestation enough of the veneration of icons, but the oldest icons there do not date to its founding. There are a variety of reasons for that, but you are already having problems with historical evidence. ialmisry, you are 100% missing the point. No, I am on point. That your "argument" has no point isn't my problem. I don't even get your "assignment". Ah, alas! The date of the Council is not as secure as you would like. It has been dated from 300 to 325. And, worse for you, only the first 21 canons are original. The rest were added at a later date. you first have to defend your dating of Elvira, and prove the canon in question (which is mistranslated, btw: the original reflects the distinction between adoration and veneration) was in the original body of canons issued. I don't understand your persistence on this point. You might as well asked for the autographs of the gospels, or ask for a copy of Palestinian liturgical rubrics for the same period. Consider, the Church didn't even set down it's liturgical instructions or other matters relating to the inner life of the Church…the stuff that was only the business of baptized Christians in good standing until the time of St. Basil. He actually said as much, that it was only recently (to him) that these things were being copied down to preserve them against loss or degradation after so many generations from the apostles. These things were not recorded because they were considered holy and thus not a public matter, and not appropriate to write down lest it fall into the hands of revilers and persecutors who would make a mockery of these things and use them to ensnare Christians for further persecution. My point, there was relatively little of the day to day life of the Church recorded for its first three and a half centuries, so making a demand for a specific sort of document and commentary from that era is not reasonable. You also brought up a local council in the early 4th century that seems to regard iconographic depictions (or something like them) in appropriate for Christian temples. Without disputing this particular council, at least on this point it's opinions did not carry sufficient force in the rest of the Christian world to challenge the presence of images. Moreover icons were not an issue for most until the time of the iconoclastic controversy, but in the end a council spoke to the WHOLE church on the matter and laid out the theology supporting icons, the appropriate use and appointment of them within the scope of Christian worship and devotion, and it also identified, warned against and censured a catalogue of various abuses of images in the Church which were thereby disallowed to continue. Since you are willing to post from a local council of the Church a prohibition of certain images, and I must assume you consider it to speak with sufficient universal force as to have some authority (else why quote it), are you equally willing to consider the authority of a universal council of the Church which spoke directly to the making and use of images in the Church, showing and distinguishing between appropriate content and use and that which was inappropriate. The 7th Council did this. It was the last council of the undivided Church. The faith it was was universally acknowledged East and West as the faith of the Apostles. Do you imagine those who sat in a local council would insist upon their own lights in the face of a proclamation of the canons of a universal council of the Church? Even Eusebius who was originally an Arian, and who was not overly fond of images in private hands, relented his Arianism when the first council of the Church condemned the teaching of Arius. Would you expect Eusebius, or the members of any truly Christian local council of ages past to assert themselves in any manner contrary to the findings and directives of an Ecumenical Council? I don't think so. So, an appeal to them as a point of contradiction of the authority and witness of the 7th council strikes me as a wee bit irrational. The fact that this or that council preceded an Ecumenical Council in time means nothing except as a snapshot of history at that time and place. What is stately clearly in the texts of the 7th council makes it equally clear, that on the point of images in the Church that in large respects that earlier council, while it may have had some valid concerns that needed addressing in it's time, it did not speak on that point with the mind of the Church and the Holy Spirit….because as you know a true council is not just a true council because someone prints an event flyer saying that it is…it is a true council because it correctly speaking the mind of the Spirit and the Church in accordance with the tradition it had received from the Apostles. So records of councils with elements contrary to the teaching of any accepted council of the church only demonstrate a particular error on their part, not a doctrinal fault with the Church at a later era. Why not take another tack as a complementary approach. We know from records of the third century icons of Christ, the Theotokos were present along with images of the Cross. These did not appear in a vacuum, did they. Their presence in the Christian community…and their broad if not at the time universal acceptance of them surely presupposes some sort of developmental history. Just because there is little or no documentation at our end of history does not mean these were innovations. To that end let me share this from the early developmental stage of icons/images in the Church it's a very special stick figure of Jonah and the Whale from the 1st century. Read the article. So while it is not a "document" per se, it is very clearly a 1st century use of a biblical image in a Christian contest. Which shows two things, first, that Christians used images, even crude ones from the earliest generations of the Church; second that these images were in use by private individuals and not just things reserved for places of Christian worship. If the markings are Christian as the researches believe, the engravings represent -- by several centuries -- the earliest archaeological record of Christians ever found, dating to about 70 A.D. The findings and their interpretation are certain to be controversial, experts said, since most scholars are skeptical of any Christian archaeological remains from so early a period. 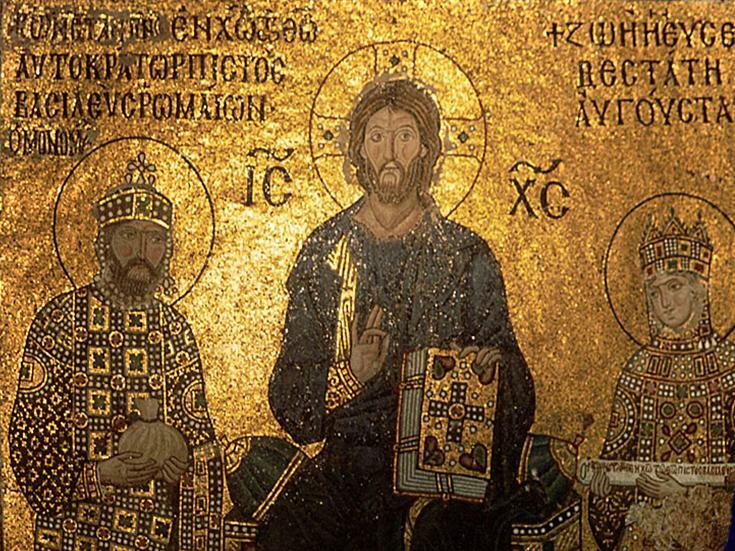 So even if/when examples of Christian images dating from the first two centuries of Christianity are discovered, most scholars would be skeptical anyway. There's just no satisfying some people! There's a difference between a living plant and an icon. "I don't believe in icons. Prove these were here from the beginning"
"I don't accept that evidence. Give me REAL evidence"
"I don't accept that evidence either." *Argument from silence postulated*. "Therefore, icons did not exist and the Orthodox Church is wrong." I'm surprised that Jesusisiam didn't claim because we had the original Mount of Sinai and not an icon there was a problem. That pretty much sums it up, but I can sum it up even better: "I know better than the Church." Excellent answers from both of you! ialmisry, you are absolutely making 0% sense at all. So are you stating the EO has no written texts of icons in the years you assigned me? That only gives credence to my argument doesn't it? LOL, I'm just not getting your logic or point. No, it blows a huge, gaping hole in it. LOL, I'm just not getting your logic or [have a] point. No, this sums up the thread. Please submit to me evidence of icons - either icons or writings of veneration, icons themselves, etc., until 150A.D. "Evidence" = Pagan art making fun of Christians, Cave art from nearly 300 A.D.
Commentary= YIM stinks, he made up his religion, we are the original church, etc. etc. 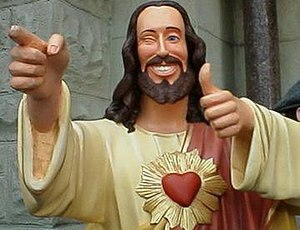 Evidence rejected = "Hey guys pagan art making fun of Christians does not prove that icons existed". More "evidence" = Controversial shroud of Turin, and other icons from 500++ A.D.
More commentary = "Well you made up your faith and EO is the original, look at your blind arguments, argument of silence"
More "evidence rejected" = The shroud of Turin is not a venerated icon, and not even known if it was original. More of a legend/fable as is the "icon of St. Luke". So I'm rejecting cave art from well past early Christianity, pagan art making fun of Christians, and the legends of the shroud of Turin & the icon of St. Luke. Also, I've asked for writings from the earliest Christians or evidence of icons. Then ial wants me to go find EO texts on icons from 300 LOL, as if it promotes his point. As much as icons are used in the EO church, if they were original, they'd be written about in as much volume as the church writes about them today "or at LEAST" written about in a couple of spots. I've been fair and the answers have been once again, pot shots, ridiculous, dodging the point, out of time frame, or dodging the question. I'd like for you to explain to everybody here on EO.net how me finding evidence & writings on icons by the EO church from 200-313 (or lack thereof) would prove that icon veneration, use, etc. existed in 150A.D. or before. I think you need to re-fix the oddball fix you gave me. Cave art? You mean the catacombs? It predates 300 by quite a bit. The catacombs go back to before 160. I guess icons and religious statues don't exist in the 21st century. 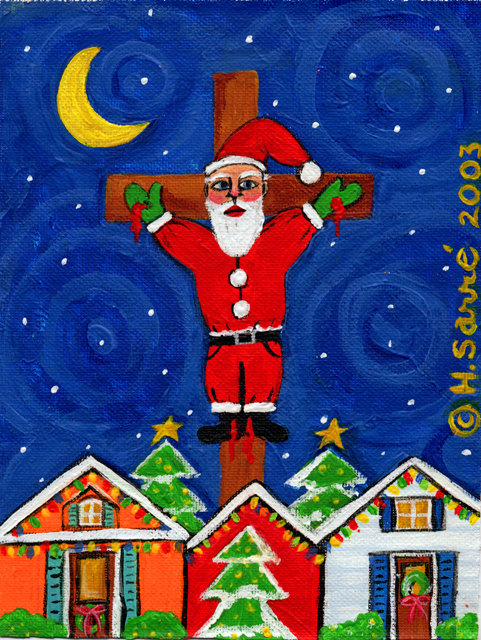 I won't put up more blasphemous selections. Page created in 0.227 seconds with 26 queries.